This past year, we’ve been working with the Department of Education on a project to help colleges provide clear and comparable financial aid information. Over the course of that project, we learned that more standard information could spur the innovation of apps and digital tools to allow students to better understand their decision to take on all forms of debt, whether it’s a federal student loan, private student loan, credit card, or other financial product. 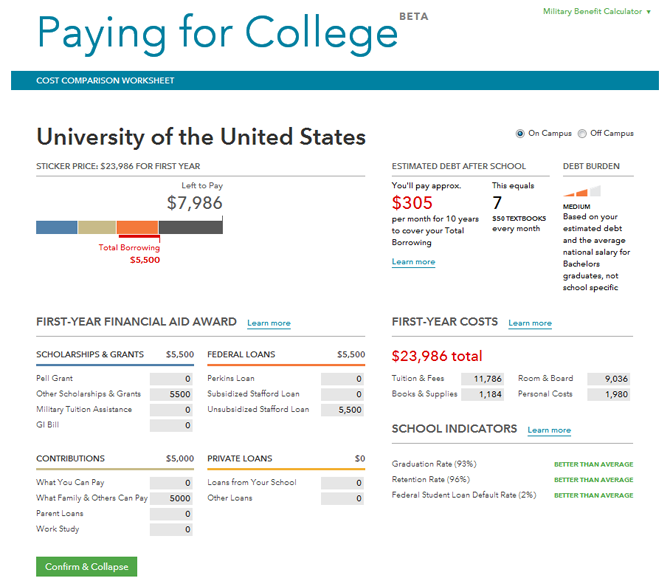 A few months ago, we took a crack at a first version of what a financial aid comparison tool could look like. The beta test of our Financial Aid Comparison Shopper was a success, and we are working hard to launch the full version in the next school year. Our early prototype was designed to help students and families make smarter choices about financing college, and we asked students, parents, high school counselors, and college financial aid officers to give us their feedback on how to improve the tool. A survey conducted by an association representing high school counselors found that over 80 percent of their members said the tool was “useful” and that nearly half would recommend the tool to students/families without a single modification. But we think we still have more work to do to build the best tool for students and parents. For example, we designed the tool for students and families with financial aid offer letters in hand. Based on the feedback we received, some users were trying out the tool to take a guess about what certain colleges might cost them before they’d even applied. Going forward we will need to make sure that users understand the purpose of the financial aid comparison tool and that it complements existing tools offered by others. A key feature in the beta test that received positive feedback was the “military benefits calculator.” This is an important element for veterans and active-duty servicemembers, and we will be thinking carefully about how to improve it further. Design: We’re pouring over web analytics about how users interacted with the tool. This will help us figure out what worked well, what was confusing, or what didn’t work. Data: We need to refine what information would be most useful to students and parents in their decision making process. We plan to consult further with some of the higher education data gurus to figure out what would be most helpful. Integration: We also want to figure out how this might interact with existing tools and initiatives offered by government agencies and the private sector. For example, we’ll want to make sure it complements other work, like the financial aid shopping sheet and the proposed college scorecard . We’ll be sure to include you on our project update list. There will be more opportunities to provide feedback throughout this process, particularly in the areas of design, data, and integration. Thanks to all of you that have participated in the project so far, and, with your help, we look forward to creating an even better version of the financial-aid comparison tool over the coming months.